Happy are those who turn away from the counsel of the wicked. obstructs our capacity to love. But we seek no obstructions, we reject wicked counsel. For whatever ways we don’t, we confess. In whichever ways we sin, we repent. Hear our prayers, O God, as before you, we seek wholeness. For thoughts we cannot bear to admit. But you know our hearts. Bind our hearts not to the unbearable but rather, to you. And the delight of your loving embrace. Praise be to God, our sins are forgiven. God’s steadfast love endures forever. Amen. Of course, I immediately regretted it and repented of my prayer, but I held onto my vengeful feelings. Because I held on to those feelings they began to fester inside of me–I grew angry and bitter, stewing over his comments. As these feelings continued, I couldn’t listen to him on the news or read about him in the newspaper without becoming enraged. I was making Newt Gingrich into my enemy. Over the next few weeks I realized that I readily make other people my enemy, including folks who interpreted Scripture differently from me, folks who held different political views from me and people who had made life choices different from my own. Simply put, I was developing a hard heart. And yet, I wanted to take Jesus seriously when he said to “Love your enemies and pray for those who persecute you,” (Matt. 5:38-48). Often Jesus’s words are given lip service but rarely practiced as if Christians mean to follow in spirit but not in daily life. During the following Advent season I decided to practice praying for my enemies, beginning with Gingrich. I told myself that it wouldn’t cost me very much of myself—silly me, I thought wouldn’t have to open my heart too much for God to actually work in my heart. I thought this would be sly way of circumventing God and not too dangerous for me, so I launched into this discipline with bravado. Additionally, I decided to read some of Martin Luther King, Jr.’s writing about loving one’s enemies. 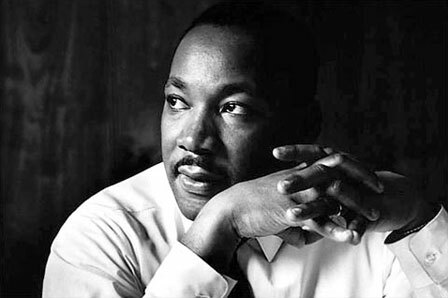 As an Anabaptist Mennonite committed to creative nonviolence, I was familiar with MLK, Jr’s writing about nonviolence and loving one’s enemies. I recalled reading the particular sermon on loving one’s enemies and I had an intuitive sense that God wanted me to re-read it. In November 1957, King preached a sermon, “Loving Your Enemies” at the Dexter Avenue Baptist Church in Montgomery, Alabama. He began his sermon by emphasizing the importance of Christ’s command to love one’s enemies. “Jesus was very serious when he gave this command;” King said, “he wasn’t playing…this is a basic philosophy of all that we hear coming from the lips of our Master.” Although I might have entered into my Advent discipline with bravado and a bit of swagger, Jesus proved to not be playing with me. That first week of Advent, I resisted the discipline of praying for my enemy. As I prayed with a reluctant heart, I discovered that I resented sharing God with Gingrich. I simply did not want him to experience God’s loving presence–I did not want God to love him. I wanted to keep God all to myself. In King’s sermon, he rhetorically asks: “How do you go about loving your enemies? I think the first thing is this: in order to love your enemies, you must begin by analyzing yourself.” God was beginning to change my heart by letting me see my heart, my resistance, and my selfishness. I was beginning to analyze myself, as King suggested. By the middle of the second week I noticed a breakthrough in my heart. I began to pay attention to Gingrich as a person and I watched and read the news with my heart rather than just my head. I imagined Gingrich as a person with hopes, dreams, sorrows, and losses rather than a one-dimensional political figure in the national media. I wondered about his family, his staff, and the people who were close to him. I began to pray for his family, that they might experience God’s presence during the Christmas season. I prayed for Gingrich and his family throughout Advent, into Christmas, and I continued praying for them until Epiphany. After Epiphany I assumed this spiritual practice was completed, but God invited me to continue the practice of praying for my enemies for an entire year. I chafed against this invitation but in conversation with my spiritual director my heart began to soften until I was able to surrender to this practice of praying for my enemies. God wanted to transform my heart from bitterness and hostility to generosity and compassion. I learned during the year that when I view people as my enemies, I objectify them. They no longer are persons with hearts, souls, dreams, and disappointments like myself. Instead, they become one-dimensional characters who are then easy for me to dismiss and disregard. Jesus understood this aspect of human nature, and in response he called us to mirror God’s nature by challenging us to love our enemies rather than objectify them, leading us to hate our enemies. This attitude of love toward all, including our enemies, causes us to become like “children of our Father in heaven,” as seen in Matt. 5:45. Praying for my enemies is a serious attempt to see my enemies as God sees them. There is a Hebrew word, chesed, that is translated as loving kindness and compassion. When I pray for others, I begin to see the world as God sees the world with this loving kindness and compassion. And when I view situations and people with loving kindness and compassion, I begin to deeply love just as God deeply loves. When I pray for my enemies I begin to reflect the nature of God. … and when you come to the point that you look in the face of every [person] and see deep down within [them] what religion calls ‘the image of God,’ you begin to love [them] in spite of. No matter what [they do], you see God’s image there. There is an element of goodness that [they] can never sluff off. Discover the element of good in your enemy. And as you seek to hate [them], find the center of goodness and place your attention there and you will take a new attitude. I discovered during my year-long discipline that I began to feel more generous toward Gingrich, and my other enemies by default. I was no longer stingy with love and mercy, giving them out in measured teaspoonfuls, fearing what might happen to me if I was loving and merciful toward those who harmed me. Rather, I began to realize that with God there is more than enough love and mercy to go around for everyone and that, indeed, there is so much love and mercy within God that God blesses both the righteous and the unrighteous. As I prayed, I became humbled — I had to if I was to be honest with my “self-analysis.” In the midst of opening my heart to God about my enemies, pouring out my pain and anger, I became more sensitive to the pain and rage in the world around me. I discovered that it becomes difficult to honestly pray for my enemies without being reminded of how God is able to love me despite my own disobedience and insensitivity. In my self-analysis, I became grateful for God’s deep love and patience toward me. After the year was over, I stopped praying regularly for Newt Gingrich—although I continued to occasionally pray for him and his family. A few years after my year of praying for him I was visiting the Mennonite Central Committee–Washington office and I learned that Gingrich and his second wife rented an apartment in the same building. I was captivated by this information. Before I left Washington, D.C. my colleague graciously showed me to the foyer outside the Gingrichs’ apartment and left me alone. In the foyer were some chairs that sat along their apartment walls and I sat down, placed my hands on their apartment walls and prayed for Newt Gingrich once again. With an honest, open heart I asked God to provide abundant love within those walls, that the former Speaker of the House of Representatives would see the world with God’s eyes, ears, and heart. And, in full sincerity, I asked God to bless him. I’ve returned to King’s sermon this past year as I’ve listened to and read so many acrimonious responses to the election. Avoiding family members or friends who disagree with me is not the answer. Unfriending or blocking someone because of their enthusiastic support of a particular presidential candidate or party is not the way of love. Loving my enemies is hard work and requires a discipline of will over emotions, intentional prayer for that person, and for my own conversion of heart. Loving my enemies requires me to see the face of Jesus in the other—and this is the most challenging discipline. Praying for my enemies opens the way to loving my enemies.